I'm gonna show you a way of hidding your files without changing their names. To begin with, you have to create a file called ".hidden"' in the same directory where you have the files you want to hide. After that, you have to do is to open that file with Text Editor and add the names of files/directories to that file, one per line. Finally, you need to refresh the view. @efthialex: A nice little tutorial about a feature a little unknown, but expedient! It works on every version of Linux Mint. chompskyhomp	 This doesn't work for me for some reason. 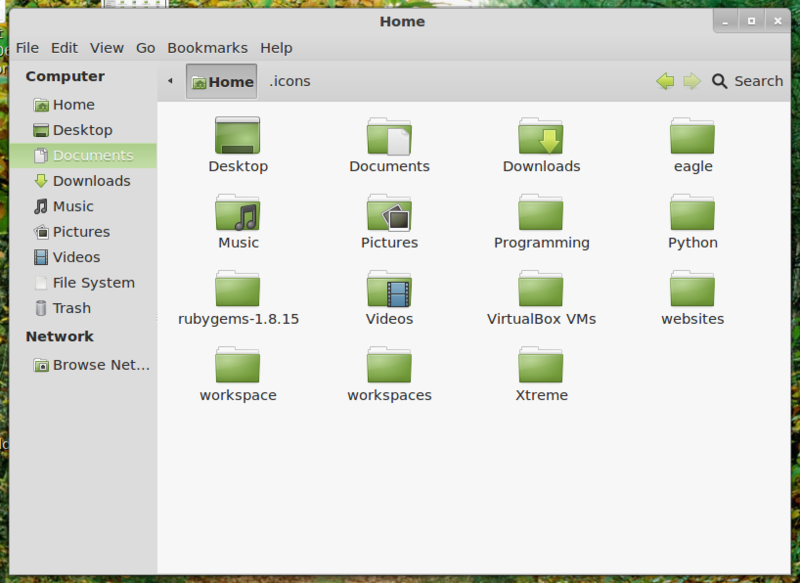 Worked on every other distro I've ever tried. breaker	 Good tutorial, I didn't know about the special .hidden filename, only dot filename. Thanks. Perkins	 Oh, couple more things, important folders at specific locations can't easily be hidden this way. (e.g. .Desktop doesn't resolve to the same folder as Desktop, so anything that points to Desktop won't find the folder if you rename it to .Desktop) Also, the command to display hidden files is `ls -a', from the GUI ^H will display files that start with '.'. 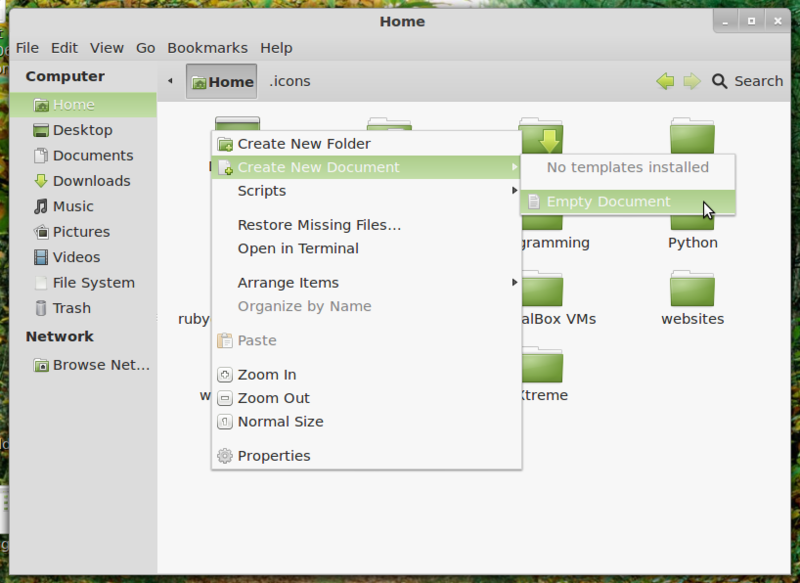 The open/save dialog boxes in gnome do display hidden folders without even a note that they are hidden (Ever notice all the . names in your home folder?). Same goes for samba shares being accessed from windows, I don't know if the .hidden file hides them from samba and the open/save dialog or not. Oh, and my advice is to leave all the folders in your home folder that begin with '.' alone, they are usually configuration files specific to the user. I didn't know this, i'll try it. Note that in windows running dir /a will show hidden files, so they are not really hidden, just not shown by default. 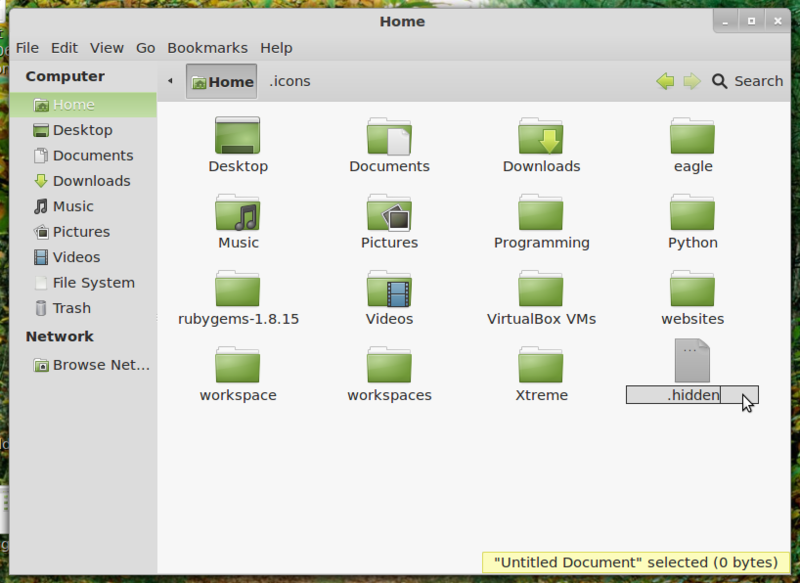 Also, with ext filesystems, any file or folder starting with `.' is hidden, this applies to folder/files or links. 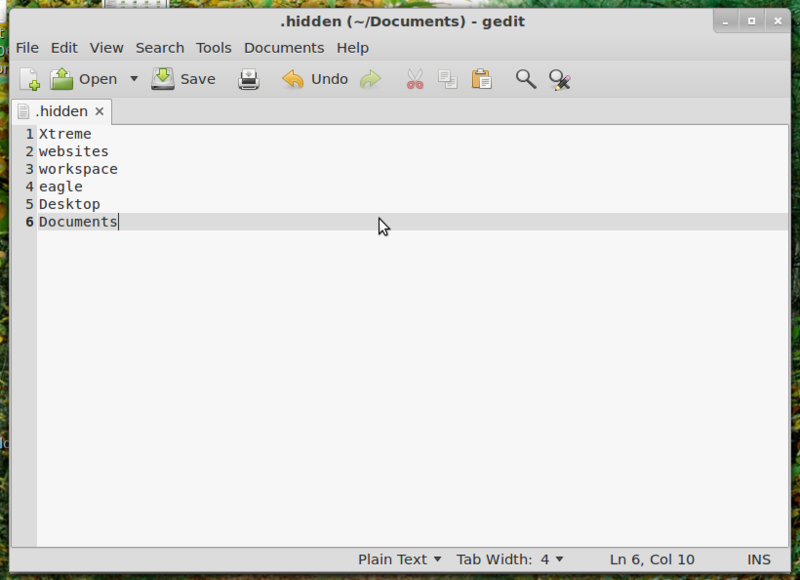 It also applies to file lists shown on the command line. If you want files not readable to others (not just hidden), run `chmod o-r' (to make them not group readable run `chmod g-r'). This doesn't hide that the files are there, but does keep them from being read. (If you `chmod o-r' a directory, the contents of the directory cannot be seen or read.) Note that none of this keeps the file owner from reading the files, only way to do that is by encrypting the files with a password. I haven't used it but it should be ok.
executable	 I don't understand why unix and linux file system don't have hidden attributes like on windows. etc file -> .file and your file would be hidden. ihends	 is there any simpler way of doing this..
can i hide the files with my rightclicks..
mysoomro	 Thanks a lot. I was looking for a way to hide some of my file, that I didn't want children to mess up with. Tonya	 Cool!!! Thank you very much! MintyFresco91	 very useful trick to prevent intruders. take that hackers CTRL + H! Useful knowledge for someone like me, which is a new user to linux. maxpestun	 Yes, very cool feature! Thanks! gonye	 Yes it's great! I didn't know the CTRL+H command. Thanks! mikefreeman	 Really cool! I didn't know you could do this! zaenal1234	 very good, without rename the file. 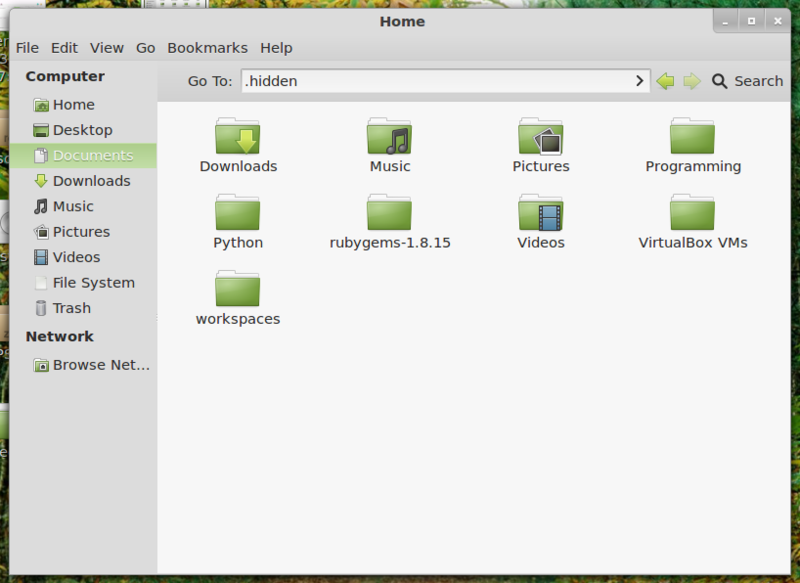 and can also be used to hide folders. sayan_acharjee	 Did not know this method. Xyie	 Sounds really useful, not just for one's self but also potentially for cleaning up an interface for someone inexperienced so they don't mess with anything they shouldn't tinker with. efthialex	 I fix it.Thank you. remoulder	 Nice, but you may want to check your spelling, beginners not begginers. Also you should mention that after saving the file you need to refresh the view.